« So where did Rykga end up? When I want to really prepare for a fight, I don’t watch dozens of videos, I don’t compare various guides. Nope. When I want to go above and beyond to prepare for a fight, I go to World of Logs. It can be more time consuming, but the depth of information is priceless. Plus, for those of us who need to apply knowledge in order to learn (if you were the kid who taught themselves math in high school by doing the exercises before reading the theory, WoL fight preparation is for you! ), I find it’s the only way to get a solid idea of the fight before the pull. Since I’ve been studying WoL a lot lately (and spamming posting my findings on my guild forums), I figured I’d share my approach, in case some of you would like to give this method a try. Note that my strategy for tackling logs varies a bit from fight to fight depending on whether I want to observe general damage patterns, tank healing strategy or boss mechanics. It also depends on how much I already of the fight (learning the heroic version vs a completely new fight). Together, you and I are going to prepare for Heroic Imperial Vizier Zor’lok. If you don’t know what you’re looking for, you won’t find it! 1) We (I) already know this fight on normal so we’re not too concerned about mechanics. 2) We know that this is a “heal through Force and Verve and don’t get hit by disks” fight so we’re not too interested in general healing strategies. 3) We do, however, want to get an idea of the overall damage patterns so we can choose our glyphs, talents and plan our cooldowns. Now that we’ve figured out what we’re looking for, we’ll know not to waste time on individual healer spell breakdowns or incoming tank damage logs. Instead, we’ll probably spend a lot of time looking at the “Total Damage Taken” graph and matching the spikes with the boss abilities from the Log Browser. We’ll probably also look at the “Deaths Overview” page to see what attacks tend to kill players. We might also want to compare a tank and a non-tank’s Damage Taken graphs with the Total Damage Taken graph. If this is gibberish to you, don’t worry, I’ll explain it all in time. It does help to review a strat guide to get an idea of spell names (and general mechanics if this is a completely new fight) before perusing the logs. Even if you can’t understand general strat guides (I usually don’t), keep them opened in tabs for references. Let’s open the Icy Veins strat and Pardeux’ strat. To find logs, select the fight (1), the size/difficulty (2) then the link to the kills (3). 1) A recent kill (patches and hotfixes constantly change fights). 2) A kill in your language (it’s a lot of extra work to decode a foreign spell names). 3) A kill from a guild with comparable dps/healing strength. The “US Guild!” logs seem perfect – fairly recent, in my language and probably in my guild’s dps range. I’m going to choose logs from another guild in the same range as well for comparison purposes. I’m also going to pull up logs of a recent kill by a top notch guild (in the first 10 pages of the kills list) so I can see how the fight looks when executed perfectly. Building our strat: Knowing the fight varies between 7 and 10.5 minutes is important for cooldown planning. Because the fights are long, we know we can use our “long” cooldowns like Guardian of Ancient Kings twice, and our “medium” cooldowns like Avenging Wrath or Divine Favor at least twice, preferably 3 times. The first two are our comparable guilds, the last is the top notch guild. These graphs make me giddy because they are very much alike. Which means the damage patterns will look like this: spiky at first, then a lull with possible minor spikes, then several intense spikes for the last ~1/3 of the fight. See the 5 buttons on the top right corner, just under “Total”? You can play with those to check who died to what and when, verify when adds die (not shown in the images I posted, but there are 2 adds in the fight) and show/hide heroism (heroism is shown in the images as the large blue bar). Building our strat: This fits perfectly with our cooldowns! We’ll pop Guardian of the Ancient Kings and another cooldown for the first major spike. We can use other cooldowns if there are spikes during the “lull” phase, and all cooldowns should be ready for use by the time the final spiky phase comes along. As well, spikes mean we’ll probably want to spec into Holy Avenger for the yummy burst healing. Once you’re in the log browser, remove the current query (1) (I’m not sure why “Show all events” comes up by default. It did take me a long time to figure out how to use the log browser because of that.) then hit “Add Query” (2). Once you’ve entered your query, hit “Run” (3). 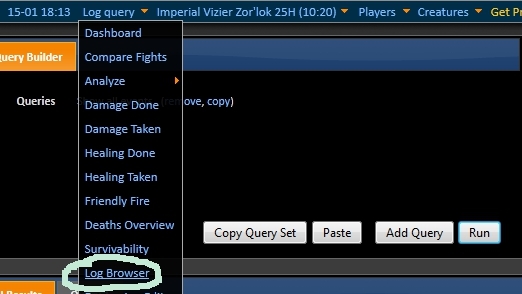 When you hit “Add Query”, the “Add Query” window pops up. The log browser only shows a limited number of lines so you have to be specific in what you’re looking for. It does take a little practice to become good at finding what you’re looking for but once you figure it out, it’s simple. 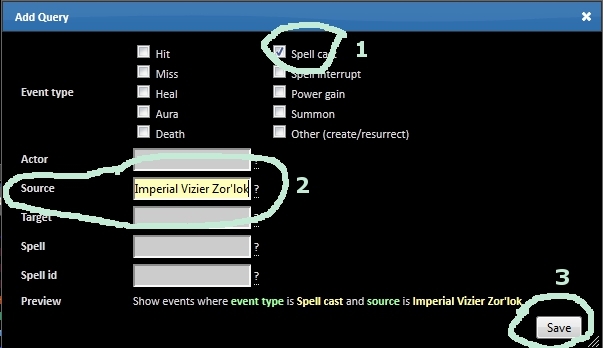 For this analysis, I want to look at spells cast (1) by the Source Imperial Vizier Zor’lok (2) (note: spelling is important when using the log browser). Then I hit save. 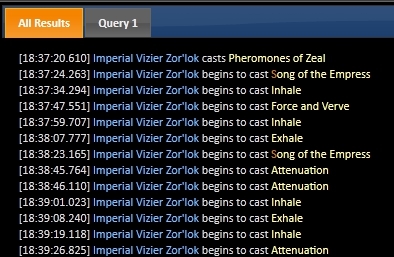 After running the query, the log shows all of Zor’lok’s casts. The rest is just matching up the spells to the Damage Taken graph. Note that there is often a 5-15 second difference between the timestamps on the log browser and the timestamps on the graph, which can be frustrating and confusing. We can conclude that all the first minor spike is probably Pheromones of Zeal damage (I would guess comparable guild #2 started the fight on the first platform, hence why they only have one spike at the beginning while the other guilds have 2 spikes), the second is Force and Verve, small spikes in between are people getting hit during Attenuation, medium spikes are likely Converts and the major spikes at the end are Force and Verve during the final phase. Building our strat: Force and Verve is going to hurt a lot, so we should be ready with our cooldowns as soon as he starts casting it. We also know that Force and Verve and Attenuation are physical damage so Devotion Aura will be useless against them (Devo Aura might be helpful would be during the transition between platforms or MAYBE during Convert, since those are the only times any Magic damage will be going out). Hand of Protection, however, might be nice making Clemency an interesting talent choice. We should glyph Divine Protection, and we could combine it with Unbreakable Spirit instead of choosing Clemency as well. Because Force and Verve is AoE damage while we’re grouped up, Light’s Hammer is a good talent choice too. Holy Prism may also be an option, though I’m feeling more Light’s Hammer. The deathlog is probably my favorite part of logs because it shows you who dies to what and when. During post-raid analysis it quickly tells you who’s dying to avoidable damage. In a pre-raid analysis, it tells you which abilities to be ready for, and helps you differentiate deadly abilities from abilities that just hurt a lot. In this kill, 10 players died to Attenuation, 10 died to Force and Verve and one tank died to normal melee damage. Building our strat: This just re-enforces what we already know: Force and Verve is going to hurt (so all CDs, talents and Glyphs toward burst healing and reducing physical damage), and we should concentrate extra hard during Attenuation. There you have it! We’re set for Imperial Vizier Zor’lok! And for your enjoyment, attached is a copy of what I posted on our guild forums. I’ve been having fun with some logs of this fight. I took a few samples and the damage patterns seem consistent across guilds. Here’s a picture and breakdown of a fight from a recent, slow (10:20 – one of the slowest recent kills I could find). I’m having a little trouble saying what’s what on the fight because the timestamp on the log doesn’t seem to match the timestamp on the graph. 1 and 2 are where the Echos of Force and Verve (1) and Attenuation (2) die. According to the log, A and C are Song of the Empress and B is Force and Verve. However, it seems more likely that A is really Pheromones and C is really Force and Verve. I tried to find damage attributed by Song of the Empress but neither the log nor the individual breakdown makes any mention of it. Force and Verve was cast only once during the Force and Verve phase (37:24-38:23 = 1 minute). D is Attenuation phase (38:23-40:36 = 1 min 13 seconds), with Attenuation combos cast 3 times. Looks like Everything Phase (G) lasted from 43:15 to 47:41 for a total almost 4 minutes 30 seconds. Force and Verve was cast at least 5 times (the logs get cut off at 47:37). The damage peaks don’t coincide with the timestamps on Force and Verve, but I suspect they should. 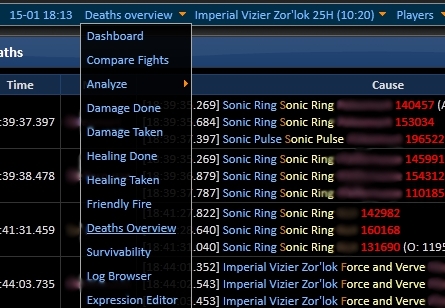 The guild in the analyzed kill had 10 deaths to rings, 10 deaths to Force and Verve and one tank getting meleed death. Also, all damage except for Pheromones of Zeal (that misty thingy in the middle) is physical damage. Physical damage CDs ahoy! As for Devo Aura, it could be used for minimal effects when we switch between platforms. This entry was posted on January 28, 2013 at 4:49 pm and is filed under Paladinning Info, Teh paladin, World of Logs. You can subscribe via RSS 2.0 feed to this post's comments. More great posts from you, though, love it! Very well detailed and usefull article, thank you.